What Is AI Art And How Is It Changing The Fine Arts Industry? Whether you’re highly knowledgeable in art history or not, you’ve probably heard of different eras of art like Neoclassicism or Romanticism. You may be vaguely familiar with major art movements like Impressionism, Cubism, Fauvism, Surrealism and Pop Art, to name a few. So what art period or movement are we in right now? Artificial intelligence and its computer-generated art is making its way into human culture. Graphic designers, programmers and even software developers might be the Michelangelos, Pablo Picassos, and Andy Warhols of the 21st century. In 2018, the first piece of AI-generated art sold for nearly half a million dollars. What’s in store for the creative arts as artificial intelligence becomes increasingly involved in art? Before we can look to the future, we should first understand exactly what AI art is, how it works, and what it can do. Digital art isn’t a new idea. For the past few decades, artists have used computers to make art. They did this by writing code that specified the rules of the aesthetics in order to develop computer-assisted art. In recent years, artists’ creative visions have grown with the capabilities of technology, transitioning to computer-generated art. This is different in that artists feed artificial intelligence algorithms which they use to learn and create by themselves. To understand the difference between computer-assisted and computer-generated art, here is an example. Imagine you wanted to use technology to help you create a visual art piece. If it were computer-assisted, you would use digital technology (such as computer hardware or software) as a tool to help you. All of the conceptualizing and design work still falls on you, but it’s made easier by electronics. accept or reject its creations. It repeats this process until the artist makes a final selection of the curated images. AI art has a lot of potential and can be used in more than just the fine arts. Jump to the infographic below, provided by Invaluable, to see an overview of how artificial intelligence is changing the face of art, or keep reading for more details. As it stands, algorithms allow AI to do practically everything that humans can. Most notably, artificial intelligence can learn without being directly programmed. That’s great as long as it doesn’t become conscious and decide to exterminate humans. Continue reading to see how AI can broaden multiple aspects of human creativity. Humans have been painting since the beginning. It’s always been a way to express a feeling or convey a message. Famous artists have come and gone leaving their mark on the progression of western art. It can be difficult for artists to find a new perspective on something that’s as old as time. That why AI is used to expand creative boundaries. It can conceptualize a style or build upon an existing one. One of the reasons AI paintings are becoming big-ticket items in the creative world is the process by which they’re made. Cognitive computing applications, such as Chef Watson from IBM, solve the age-old problem of having too many cooks in the kitchen. This machine, and others like it, assist head chefs in developing new recipes and flavor combinations. Whether you’re a home-chef or running the kitchen at a Michelin 3-star restaurant, you can pick the flavors you like in order to create amazing dishes. If you’ve ever used the automatic translate functions in computer software or online apps, you’re aware of how critical some machine errors can be. However, neural networks allow AI to generate cohesive literature from poetry to screenplays to novels. These networks are statistical models that predict linear sequences. The computer receives a sample text, identifies unique words and groups the words based on frequency. Then the user chooses a starting word and the computer guesses the next likely word. Based on these first two words, the computer guesses a third. Based on the three words, the computer finds a fourth, and so on. Algorithms can predict what audiences want and, therefore, which songs could be a hit. Musicians can use this prediction to find a theme or mood for their songs. Additionally, music-generating algorithms can create melodies that artists can build upon. One way AI can help dance performers come up with fresh routines is by producing choreography. Machines can do this by “watching” hundreds of hours of dance footage and using algorithms to learn. Then it recreates a dancer’s style with new gestures and movements. Critics of AI art say that it’s impossible for algorithms and information processing systems to mimic the human thinking and reasoning necessary for the creation of art. Furthermore, there is some conjecture surrounding the owner of computer-generated work. It’s been proposed that technology is in the beginning stages of replacing humans as creators. However, many believe that the human is still the creator as long as the algorithm is original. It’s possible that digital art could be next major art movement. Who knows? Maybe in the next century students will learn about the AI art movement just as we learned about 18th and 19th century art periods. We may even create a greater need for artificial intelligence in art, and in life, which could spur further technological innovation. 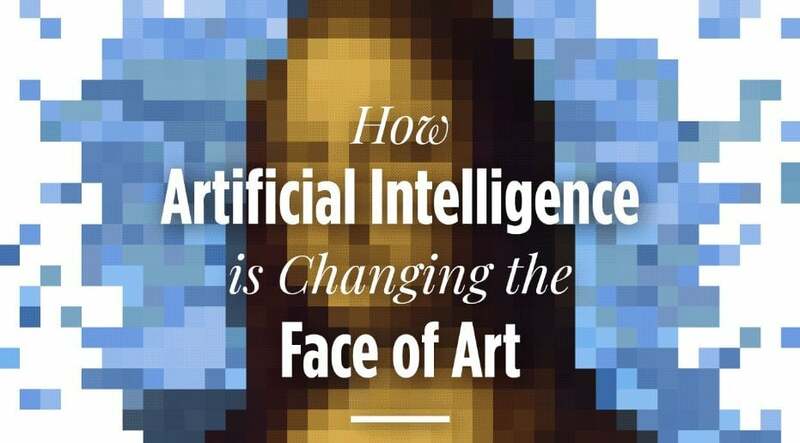 Check out the infographic below for a visual breakdown of how artificial intelligence is changing what we know about art.